What we think of 'em: These are merely miniature versions of ACTUAL Doritos (items we would never normally eat). We MUCH prefer Baked Doritos because, not only do they taste better, but you'd get to eat more of 'em for 100 calories. These do taste good (doy!) but they're not the most satisfying 100 calorie snack. And we'll ask it again. Why not use the BAKED ONES? What we think of 'em: These are small bags of Baked Cheetos. (For those of you living under a rock, Cheetos are crunchy, cheese-flavored snacks made from cornmeal.) We absolutely LOVE these things! They're baked (and not nearly as greasy as regular Cheetos), but are just as satisfying as chewing on the real thing! They're definitely more substantial than the Doritos (even though they both have 30 per bag), and therefore you feel like you're eating more. A satisfying, delicious treat. Bravo! What we think of 'em: These are a bit strange. They look like teeny tiny Doritos, because of their triangle shape, but they don't have a chip-like crunch. In fact, they're kinda soft, which actually makes them more like crackers than chips. They also have a "day old" Taco Bell flavor, which is a little bit gross (unless you like leftovers from TB). They have a kick to them, and are a bit spicy. They're definitely missing the creamy, smooth flavor some of these other snacks have, though. But if you're going for straight quantity, remember, you get 218 of these tiny little suckers per bag! What we think of 'em: Once again, these are just regular old cheese snacks in portion controlled form. Don't fool yourself into thinking they are healthier, or diet-friendly in some other way, 'cuz they're not. Also, despite the fact that you get 47 of these things in each pouch, they just aren't that satisfying. The main problem is, they taste GREAT and the serving size is so small, you'll want to eat three bags at a time. Cheetos, why not use BAKED versions in these pouches? Someone tell us! Chester? Anyone!!! What we think of 'em: You get a whopping 70 little fishies in each pouch. Impressive! 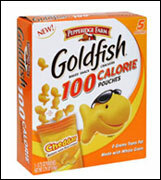 They're also baked, and made with whole grain, but taste exactly like regular, plain old original Goldfish. These were excellent and we loved the serving size. Satisfying and delicious! The world was first introduced to Crunchy Cheetos in 1948. A baked version wasn't introduced until 2004. Humans love cheesy snacks. Share this email with friends and relatives by clicking "send to a friend" NOW! HG Heads Up! We know these aren't "healthy" treats. We know you're better off eating a very large apple or a nice cup of lowfat yogurt for the same amount of calories. This email is intended for people who are looking to indulge in a cheese-flavored, crunchy snack every now and then. BTW, none of the snacks featured today have any Trans Fats.